There are so many creative individuals out there who have dreams of owning or running their own business and sharing their crafts with the world. But for most, this is just a dream. While many may be passionate about what they do, they may not have the know-how or the ability to get their work out there. Some may have issues with the administrative side of things, which deters them from getting their business started. Others may not be familiar with social networking (a now important part of marketing) and therefore lag behind when it comes to building their name within the creative industry. This book may provide the inspiration necessary if you are one of these people. 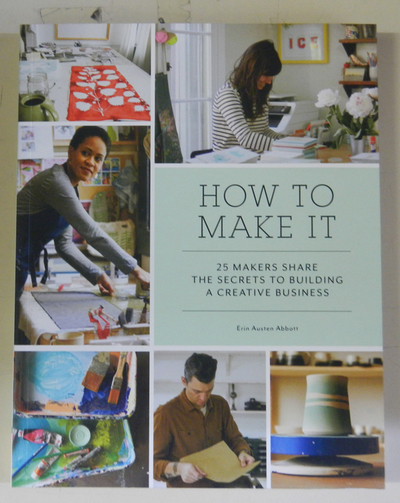 Highlighting the stories of 25 different American makers, this book delves into the day-to-day schedules of people who have successfully combined business with pleasure to make their creative dreams come true. Each profile includes background information about the business, as well as interview questions and answers regarding challenges, successes, collaborations and advice picked up or learnt along the way. With pretty photographs of the people in their workspaces, as well as mix-tape playlists of songs that inspire them in their studios, this is more than just a business book- it’s a carefully crafted portfolio of people in an increasingly popular handcrafting community. The business owners themselves vary, with ceramicists, jewellers, leatherworkers, stationers, painters, woodworkers, and illustrators amongst the mix. Each profile section also contains a DIY project that fits in with the business‘ craft, which the reader can attempt to make themselves. If you need some entrepreneurial inspiration to start your own creative business, but don’t want to read a dry or boring book about the way to go about it, then How To Make It (a clever play on words, I might add) may provide just the right amount of wisdom that you need to get yourself started when growing your brand.